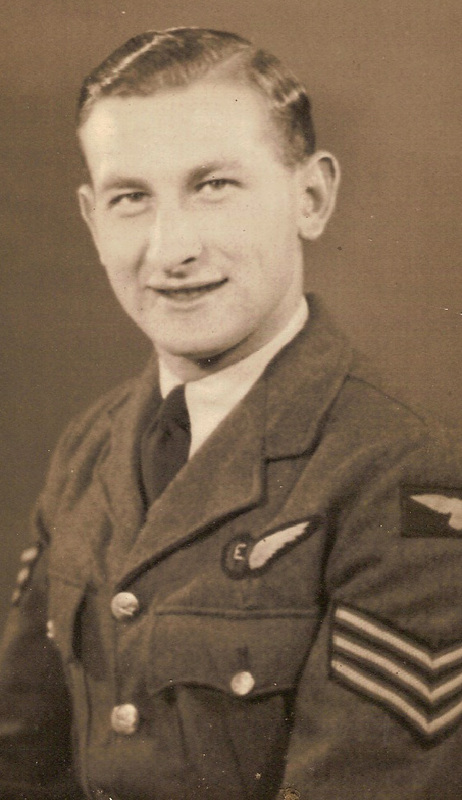 John Kinnear, probably photographed in 1942, with his Flight Engineer’s wings. John Kinnear was typical of many of the flight engineers who took part in the Dams Raid, in that he had converted from ground crew in the the period after mid-1941, when the RAF dropped its earlier policy of putting two pilots on heavy bomber crews. He was known to his family as Jack, but in the RAF, this was inevitably changed to Jock. Kinnear was born in 1922 in Newport, Fife, a small village on Tayside. His father had once been the chauffeur to the Dundee MP and publisher Sir John Leng, and the family had lived on the Leng estate. He was a mechanically-minded young man who had worked as a garage hand before joining the RAF in 1939, at the age of 16. After more than three years work on ground crew, Kinnear was finally sent for training to the flight engineer training facility, No 4 School of Technical Training at RAF St Athan, and qualified from there in the late summer of 1942. He was then posted to a conversion unit, and teamed up with Floyd Wile, Albert Garshowitz, Richard Bolitho and Don Hopkinson, who had arrived at the unit with pilot Max Stephenson. Frank Garbas was also added to the crew at this time. The full crew was then posted to 57 Squadron at Scampton. Sadly, Stephenson was killed on an operation with another crew and the crew were then assigned to experienced pilot Bill Astell. After a number of operations in February and March, they were told that they were to be posted to a new squadron, to be formed at the same station, Scampton. This, of course, would soon be known as 617 Squadron. Bill Astell and his crew were kept busy in the training period before the raid, but there were the occasional leave periods. On what turned out to be their last short break, Kinnear and his colleagues, Floyd Wile, Albert Garshowitz and Don Hopkinson went to stay with the family of rear gunner Richard Bolitho, at Kimberley near Nottingham. Their luck would run out shortly after midnight on the raid, when they hit a pylon and crashed near Marbeck. The explosion was so fierce that it wasn’t until the next day that the wreckage was approached by the Germans. Along with his comrades, John Kinnear was buried first in the City Cemetery in Borken. They were all reinterred after the war, and lie together in the Reichswald Forest Commonwealth War Graves Cemetery. Please, does anyone have photos/memories of my dad, William (Bill) Warr. He was Sergeant Cook in Charge of the Mess at Scampton. Thank you.